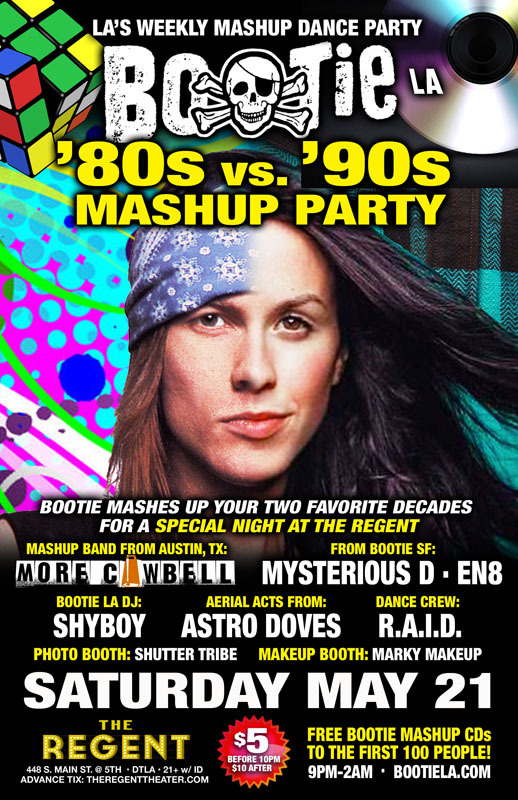 Bootie LA returns to the Regent for a special night – it’s ’80s vs ’90s Mashup Night! At 11 PM, awesome live mashup band More Cowbell (from Austin, Texas) returns with their high-energy antics, while Mysterious D and EN8 come down from Bootie SF to join resident Bootie LA DJ ShyBoy as they mix and mash all the ’80s and ’90s genres with music from multiple decades, paying homage to the eras yet keeping the music fresh. Plus Astro Doves fly high above the stage, along with the go-go antics of resident dance crew R.A.I.D., as they give ‘80s and ’90s realness, Marky Makeup giving you righteous makeovers, and Shutter Tribe captures it all! All this and FREE Bootie mashup CDs to the first 100 people through the door! Don’t forget to dress in your favorite fashions from the ‘80s or ‘90s!